Synopsis: In 1971, Roger and Carolyn Perron (Livingston and Taylor) and their five daughters move into an old farmhouse in the Rhode Island countryside. Soon after moving in the family starts to experience increasingly disturbing events that cause them to seek out the help of paranormal investigators Ed and Lorraine Warren (Wilson and Farmiga). Upon their arrival the Warren's discover the Perron's are being terrorized by an evil and powerful force that will test their faith more than any case they've taken before. Andrew: Hello readers! Earlier this week I was able to catch a screening of this week's new horror film The Conjuring, directed by James Wan, who directed two of my all-time favorite horror movies in Saw and Insidious (as well as the underrated Dead Silence and the upcoming Insidous sequel). Needless to say, I had been looking forward to seeing Wan's newest film ever since I heard it was in the pipeline. Then, as the promotional train started picking up steam, my interest grew even more when I found out it was about the paranormal investigative couple Ed and Lorraine Warren - until now most famously known for their investigation into the Amityville Horror case in the mid-1970s. And although Ed passed away some years ago, Lorraine still lives in their longtime home in Monroe, Connecticut...which is just a forty minute drive away from where Sarah and I live. Now, I've been interested in the horror genre since I was a kid. I read every "Goosebumps" book R.L. Stine ever wrote, I read and was terrified by the "Scary Stories to Tell In The Dark" books and I caught every single episode of "Are You Afraid of the Dark?" on Nickelodeon when I was younger. As I grew up I started reading Stephen King books and watching horror films I probably shouldn't have been watching like John Carpenter's Halloween and The Thing (which left the biggest impressions on me) [UPDATE: You can read a term paper I wrote on Halloween from college that we posted back in October HERE], slasher classics like the Friday the 13th and A Nightmare on Elm Street series, and other genre classics that I hold dear like The Shining, Poltergeist and (to a lesser extent) The Exorcist. 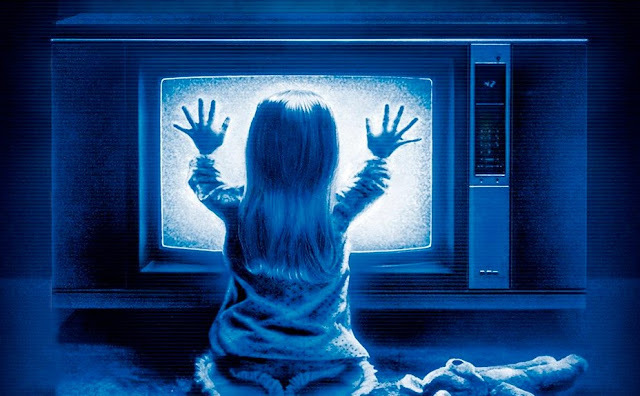 Tobe Hooper's Poltergeist is one of the films that had the biggest effect on my love for horror films. Those were the movies that left an indelible impression on me and helped cultivate my love for the horror genre. Those were the movies that got my imagination running and kept me sleepless many a night as a young teenager. And it's those last two I mentioned that that we'll come back around on because, for all intents and purposes, The Conjuring would have scared the living bejesus out of me as a kid like those two did. And, in fact, it still did. When I say The Conjuring scared me, I don't mean that it had me quivering in my seat while I was watching it (though it certainly sent a chill down my spine on more than one occasion). I mean that it stuck with me once I got home for the night and tried to go to sleep. I'll never admit it to Sarah, and she'll never read this particular review so she won't find out unless one of you tells her, but I couldn't sleep the night after I saw Wan's creepy masterpiece because all I kept thinking about was what could possibly be standing over in the dark corner of the bedroom, or "Did I just hear something out in the living room?" That, I feel, is the mark of a quality horror film. I'm a grown man now and James Wan was successfully able to tap into the deeper parts of my brain, to a more primal section, where my mind roams free and I can't contain it because I've been so energized by the terrifying images I saw (and didn't see) on the big screen earlier that night. But how was Wan able to do such a thing, and do it so successfully? The answer is: in a number of ways. 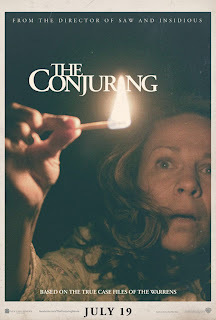 The Conjuring harkens back to an older kind of horror film where they didn't try to freak you out with outlandish gore and scare you with cheap jump-scares. Wan utilizes an old-school approach of taking his sweet time to build up the suspense, to give you glimpses of what's to come later but not really giving away the good parts until the final act, and the impact the finished film has is so much better for it. Following a brief introduction to the Warrens (Farmiga and Wilson), the film primarily follows the Perron family as they move into their new house they bought from a bank auction. We're there as Carolyn (Taylor, Netflix's Hemlock Grove) first starts to notice things like all the clocks stopping at 3:07 the previous night, their eldest daughter mentioning a terrible smell in her room when she was sleeping, the death of their family dog, and the discovery of a basement that had been boarded up for some reason. We're there when paranormal activities start to escalate in nature all culminating in a horrifying sequence where Carolyn is attacked and isolated in the basement while her daughters are terrorized upstairs. Only once we're invested in the family does Wan bring in the heroes and true focus of the film. And it's only really when Ed and Lorraine enter the picture does Wan start to pull back the curtain and give us better looks at the horrors plaguing the Perron family. It's a very successful Jaws-esque maneuver that lets our imagination think up what terrors there might be in the dark at first and then slowly reveal the true antagonist, all the while still slowly building up to an explosive climax. most famous for investigating the Amityville Horror with her husband, Ed. Ed is a man of faith and a noted demonologist, while Lorraine is a clairvoyant and medium who can see physical manifestations of the spirits and demons in the world. 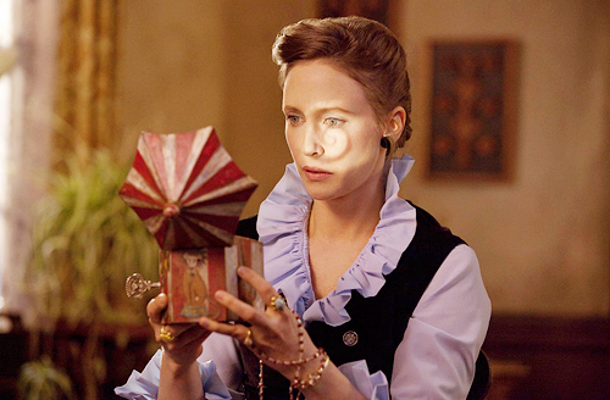 Wan is able to take these two characteristics to simply show the audience what Lorraine can see and nobody else can, and Farmiga is great in subtly showing Lorraine's connection and reactions to the paranormal. Wilson does a great job playing the loving husband who worries about the toll cases like this take on his wife. It's at this point that Wan's film could start to fall apart as it really starts to resemble Tobe Hooper's Poltergeist, with the Warren's bringing in a crew to try and capture evidence of the entity in the house so that they might be able to convince the church to do an exorcism. It's here that Wilson also does a great job helping the audience totally buy into scenes of them setting up cameras and microphones to catch any glimpse of the entities they can. But while some beats certainly feel familiar, Wan is able to keep his own spin on the proceedings and managing to mix in some levity with the horror, too. I also give credit to Wan and his director of photography John R. Leonetti (who has DP'd for Wan since Dead Silence) for using the best possible, and creative, angles throughout the film (particularly during the second half) plus the occasional tracking shot that gave me a great feel for the layout of the house. Lorraine Warren into a new horror frachise, and so do I. At the beginning of the movie when we're introduced to the Warrens via a very creepy scene involving a possessed doll, we're also introduced to a room the Warren's keep in their house that displays/imprisons numerous artifacts they have come across in their illustrious career. With all the different items located inside that museum, New Line Cinema is hopeful that the success of The Conjuring could lead to a brand new franchise centered on the Warrens and the tales on these different artifacts. I'm hoping this happens as well. Also, this museum is a completely real thing! A few weeks ago I read an article in Entertainment Weekly about the film and the Warrens, and it makes a point of explaining that the Warren Occult Museum is certainly real and is open to the public on a "by-appointment" basis. Every now and then Lorraine Warren and her son-in-law, Tony Spera (the current head of the New England Society for Psychic Research that Ed and Lorraine founded) hold events called "Warrenology" where you can pay $109.00 to view case files and have a Q&A with Lorraine, tour the museum, take a trip to a graveyard where they'll teach you how to take "psychic photos...and how to protect yourselves from evil and otherworldly entities," plus the night ends with a dinner at an Italian restaurant and a photo op with Lorraine. Fun! I've been attempting to get in touch with Tony Spera for a couple of weeks now to see if I might be able to take a tour of the museum for an article, seeing as I currently can't make any of the upcoming Warrenology events that haven't been sold out yet, but I've been unsuccessful. I'm going to keep trying to get in touch with him so I might be able to tour the museum and write up a cool story on it for our blog, so fingers crossed there! Regardless, The Conjuring is a modern horror masterpiece, in my opinion. Wan has been able to transition from being "the guy who made Saw" into a completely successful master of old-school horror, first with the effective Insidious and now with The Conjuring. I'll be very interested to see how this one does at the box office, as it deserves to be a huge hit. This is the kind of horror movie audiences should be clamoring for, not bad rehashes and adaptations of older films like Texas Chainsaw Massacre. So please do me a favor and go see this one so we can get more films like it. This is the kind of film kids watching scary movies at way too young an age should be watching so they can fall in love with the genre just like I did. Remember when that thing was just chilling on top of the amoire and jumped down. Jimminy Christmas! I would love if a franchise would be made of these cases by The Warrens. This is the best Haunted House movie I have seen in a while. Was not a fan of Insidious but will now check out Dead Silence based on your recommendation.